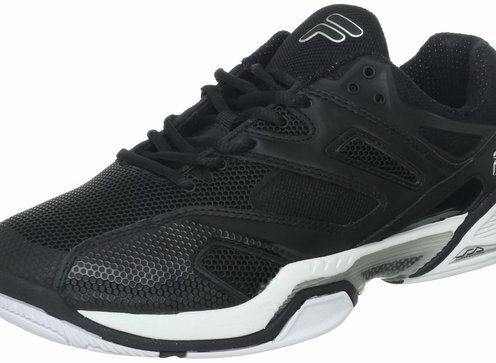 Fila began designing the Sentinel with a blank slate and built a brand new modern shoe that could hold up even at the highest levels. The shoe is all about cushioning and stability and assuring that you'll be confident and comfortable zooming around the court. A molded sock-liner combines with the blend of materials in the upper to provide lots of support for your aggressive on-court movements. Players that prefer having a little extra room in the forefoot will also enjoy the slightly wider fit. The full-length Evergrind outsole features a modified herringbone pattern for great traction on all surfaces and is backed by a six month durability guarantee. The Sentinel's comfortable fit will have you focused on your game, and not your feet. Fit: Length is slightly short, and we recommend ordering a 1/2 size larger than your usual size. Width is medium to slightly wider in the forefoot. Arch support is medium. No break-in required. Upper: Synthetic materials line a layer of mesh for exceptional cushioning and stability. A memory foam heel collar also helps to provide a personalized fit. Midsole: Super Action technology offers enhanced cushioning and support, and a Blown Polyurethane molded sock-liner gives lightweight comfort and even more cushion. Outsole: The Evergrind outsole features a modified herringbone pattern and flex grooves for extra comfort and traction. It's backed by a six month outsole durability guarantee.